If you are like most people, you have a lot for which to be thankful. It is important to teach children not to take for granted all that they have. A great way to do this is by creating Sunday school activities about thankfulness based on Children's Worship Bulletins. In today's world, it is too easy to take for granted all of your blessings. From a loving family to a loving God, to having all you need to live, most likely you have a lot of things for which to be thankful. The activities in our bulletins provide a fun and entertaining way to learn this lesson. Below is one example of the entertaining activities about thankfulness created from our Children's Worship Bulletins. Print out the bulletin with the activity you would like to share. Make enough copies so that each student has one. Print out the answer key. Gather enough pencils or crayons for all the students. Select partners or have the students work individually based on your class' abilities. Hand out the activity sheets and pencils or crayons. Ask the students to circle the hidden objects in the picture. Go over the correct answers with the children once the activity is completed to ensure they have found all five items. Now ask the students to draw some things that they are thankful for in the margins. Give them time to share their ideas with the class. This is a great time to talk with them about prayer. "Jesus thanked God for the bread by praying. We can thank God for the things we have just drawn by praying as well." Lead the class in prayer for the items they drew then allow each child to pray for their own items. We have hundreds of bulletins available to you for downloading so you never need to worry about not having an activity for Sunday school. All of our bulletins are Bible-based and full of relevant material. You can use the activities as they are or make group games/activities out of them to meet your needs. With passages based from the Old Testament, the four Gospels and the Epistles your students will learn and have fun as they complete puzzles, word pictures, mazes and more. 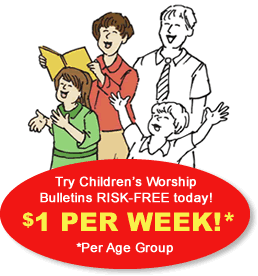 We offer two age groups for our bulletins, 3-6 years of age and 7-12 years of age, so there is something for everyone. All bulletins are approved by an educational specialist.